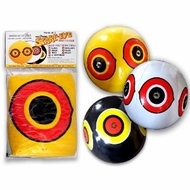 Hang the 2-Foot diameter (16-Inch Inflated) Scare-Eyes from trees or long poles to scare away flocks of nuisance birds who are repelled by its bright color and the unusual design. The eyes exaggerate the glaring eyes and gaping mouth of a predator bird. Office building and apartment managers use Scare-Eyes confidently to get rid of pest birds. Applications: Gardens, Farm Fields, Fruit and Nut Orchards, Berry Patches and Fields, Homes and Apartments, Stores and Office Buildings, Fisheries and Ponds, Boat Docks, Parks, Lawns, Shade Trees, Decks, Porches, Swimming Pools, Barns and Farm Buildings.